ST. GEORGE — A mountain climber fell approximately 50 feet Saturday after losing control while descending a 100-foot cliff. 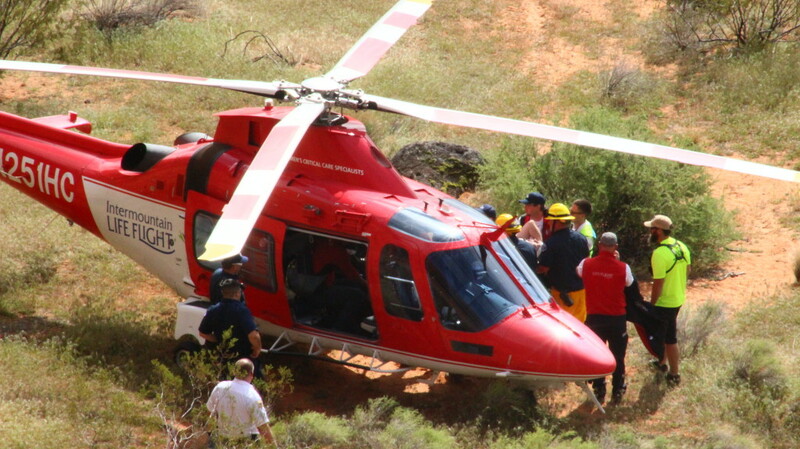 Emergency responders were dispatched at approximately 1:40 p.m. to the Cougar Cliffs area 6 .miles north of St. George off state Route 18. “I don’t know why he fell. They did not have a bottom belay on the line so he was belaying himself,” St. George Fire Department Battalion Chief Darren Imlay said. A belay is a technique used when rappelling where another climber pulls the rope tight from below, keeping the person above from falling. 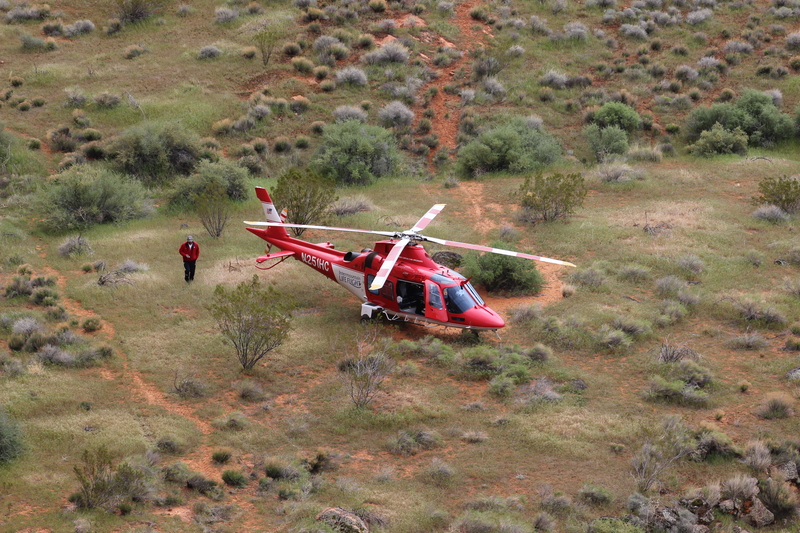 The climber was stabilized at the base of the cliff and then carried to the Life Flight helicopter waiting on scene. The extent of his injuries are unknown. 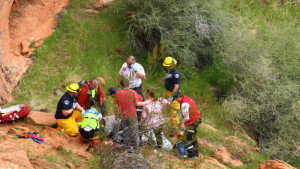 The injured climber fell from the same cliff that Brittany Fisher had fallen from four years earlier. Fisher had been out at the cliff face earlier for a ceremonial rappel. Washington County Sheriff’s Deputy Darrell Cashin said there was a sense of disbelief when the call came in for search and rescue of the injured man. Cashin said when he entered the GPS coordinates he initially thought that he had forgotten to clear the GPS and re-entered the numbers. Only then did it dawn on him there had been a fall where they had been hours before. 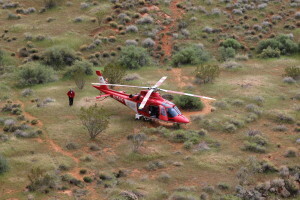 The Life Flight helicopter and pilot who participated in the morning event returned for the injured man. St. George Fire Department, Washington County Sheriff’s Office, Washington County Sheriff’ Search and Rescue crews and Gold Cross Ambulance responded to the incident. Good heavens! This piece reads as if the writer himself fell and bonked his head. And the information relative to rappelling is incomplete, if not misleading. Believe me, climbing up the rock is often safer (and more enjoyable) than pretending you’re fit for commando missions! Weeeeeeeeeeeee! I believe this should read four hours earlier, rather than four years. In response to the previous comment, there is no information right or wrong regarding rappelling in the article. 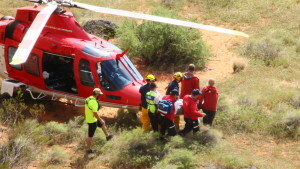 The victim may well have not been rappelling. As an important parenthetical side note, climbing and rappelling require a significant amount of competent instruction and practice to be done as safely as possible. There is alot to know. That said, accidents happen and the margin of safety is fairly narrow. I know alot of people who comment that they are just into rappelling but don’t climb as they think it is too dangerous. But, climbers know that rappelling is where avoidable accidents happen. Again, there is no substitute for competent instruction and vigilant awareness to help minimize avoidable injuries. I hope that the person in the article makes a full recovery. Avoidable accidents can occur anywhere, whether climbing, rappelling, or falling off the toilet. My hope is that the reader of this comment make a full and lasting recovery from all the puffed up rhetoric. 😉 I love the “important parenthetical side note” that, in fact, constitutes the writer’s main point. On the rappelling issue. Re-read paragraphs 3 and 4. I re-read paragraphs 3 and 4. This is a news article not an analysis of the accident. Of course it’s incomplete. Chief Imlay’s comment might point to the victim rope soloing – hard to know at this point. My (puffed up rhetoric) is an attempt to encourage people who rappel to not take it lightly and instead get good professional instruction so that they can be as safe as possible. Climbers are interested in accidents like this because we have a lot to learn from what goes wrong. I’m frankly too busy to troll St. George News articles and make comments. But, good luck with that. But if we ban rock climbing, these things wouldn’t happen anymore. Just like drug laws stopped drug abuse, and gun laws stop crime, if we can save even one life by banning climbing, don’t we owe it to our children? Come on people, where are all the calls to ban everything in the name of S-A-F-E-T-Y? ?